Don't you hate how sometimes work gets in the way of the things you'd rather be doing? 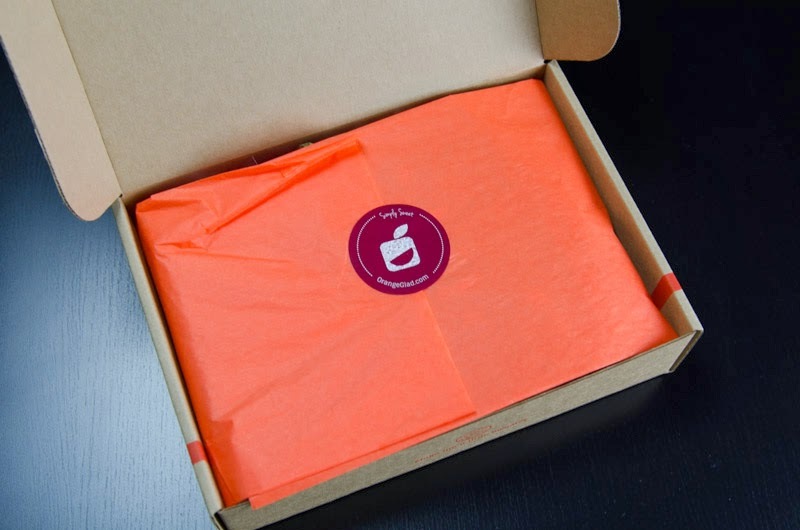 Like writing blog posts about your subscription box habit? Yeah, me too -- it's been one of those weeks. But it's Saturday! And I'm back with some brunchable treats. 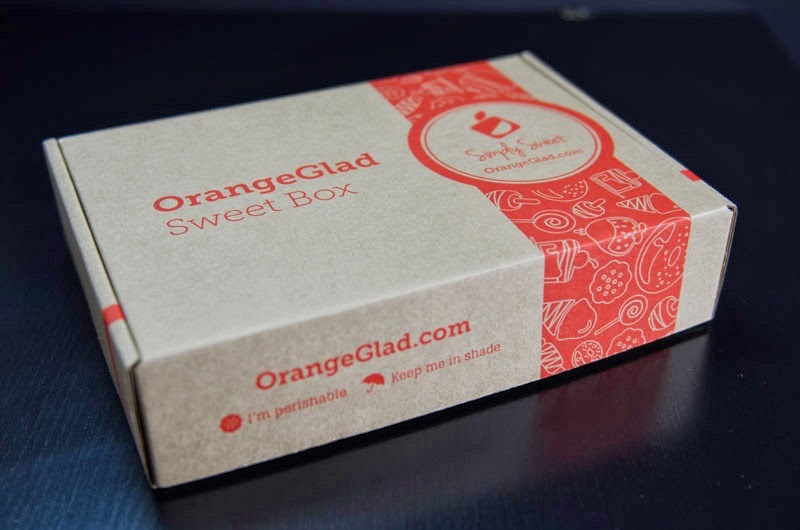 For the uninitiated, Orange Glad is a monthly gourmet dessert subscription: for $15 plus shipping and handling (about $21.95), each month you receive a box of five baked goods, chocolates, or other confections. You can save some money off the monthly price by committing to three or six months of box deliveries, and you can also opt to receive twice the amount of goodies for an additional $12. Not into commitment? You can buy single boxes too, for the same amount, no need to subscribe. I wish more sub services offered the option to get single boxes! It's a great way to sample the sub before deciding whether or not it's for you, and probably saves quite a bit of time FAQing and emailing and unsubscribing. So I really appreciate Orange Glad's purchasing flexibility. And then there's the packaging and design, which Orange Glad has down. From the clear plastic packages to the pops of bright pink to the cute cardboard-brown branded stickers, these guys are all about presentation, and the cohesiveness really makes unboxing feel like opening up an expensive present. 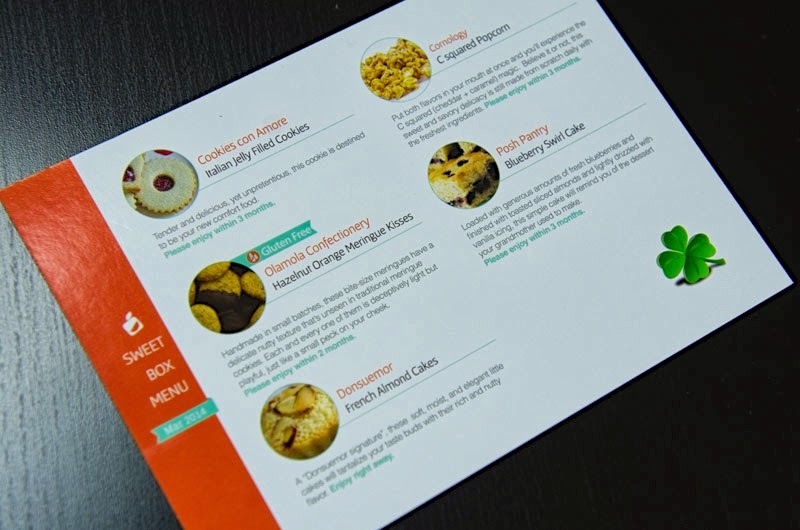 The enclosed information card lists each of the treats in the box by name, includes a short description, and tells you approximately how much time you have until it expires ("Enjoy right away," "Enjoy within 3 months," etc.). Cookies con Amore Italian jelly-filled tea cookies. $15 per lb. These cookies, aside from being adorable, are also made with all-natural ingredients (cage-free eggs, organic cane sugar, unbleached wheat flour) by former restaurateurs based in California. 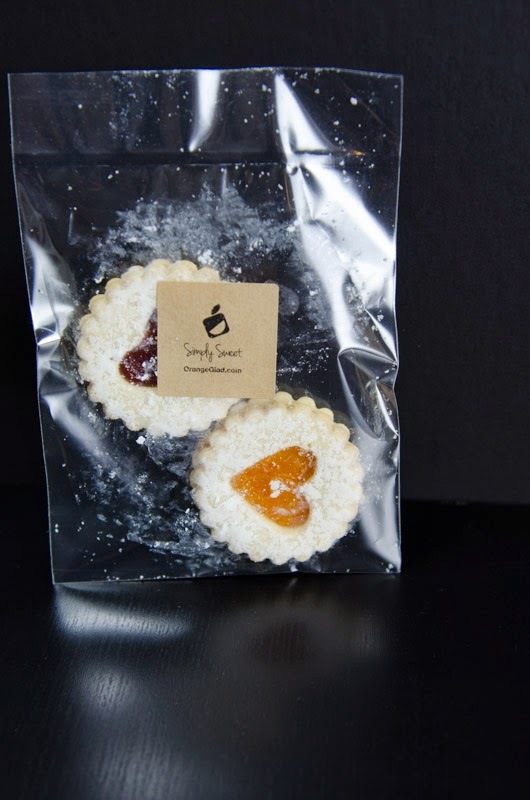 I received a strawberry jam-filled cookie and an apricot jam-filled cookie, and they both tasted home-baked. Delicious. By the way, I forgot to mention that Orange Glad also has a small virtual shop where you can purchase a selection of the products featured in it boxes. These cookies were not available at the shop as of this writing, but you can find them at the Cookies con Amore site. 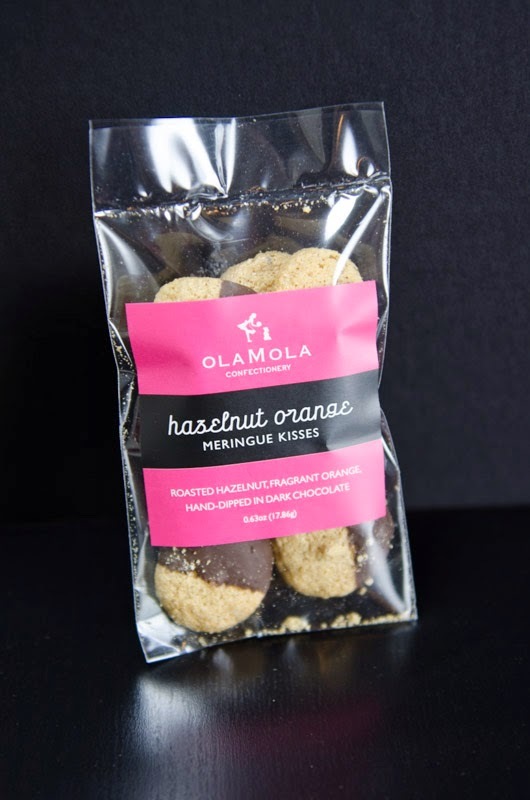 OlaMola Hazelnut Meringue Kisses. $35.95 for a "party pack" at the Orange Glad shop. I thought these might be super crunchy and tooth-unfriendly, but they're actually really light, airy, and crispy-soft. An absolutely delicious chocolate-dipped bite. These were gone seconds after the bag was opened. I get that they're sold in individually-packaged party packs, because they'd make awesome party favors. 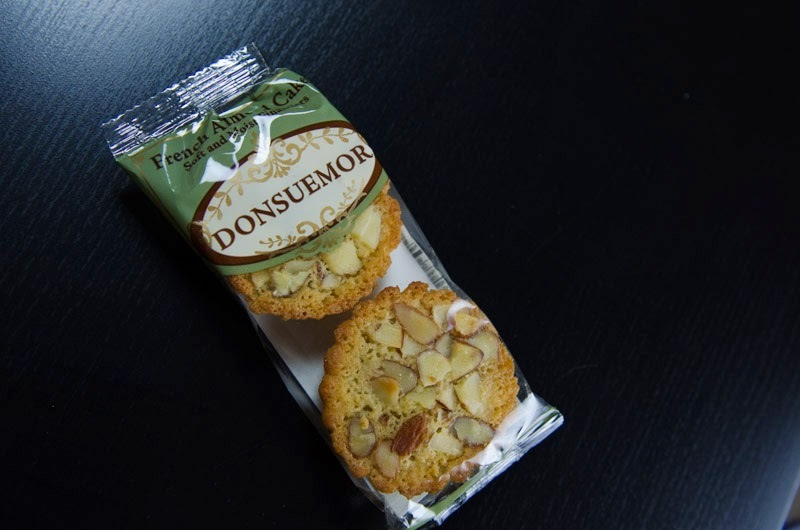 (Left) Donsuemor French almond cakes. $17 for a box of 20. Not available in the Orange Glad shop. These small almond tartlets, also known as financiers in French, are sweet, moist, nutty, and basically perfection with a cup of café au lait (or, in my case, just a plain ol' cup of pod-brewed coffee). 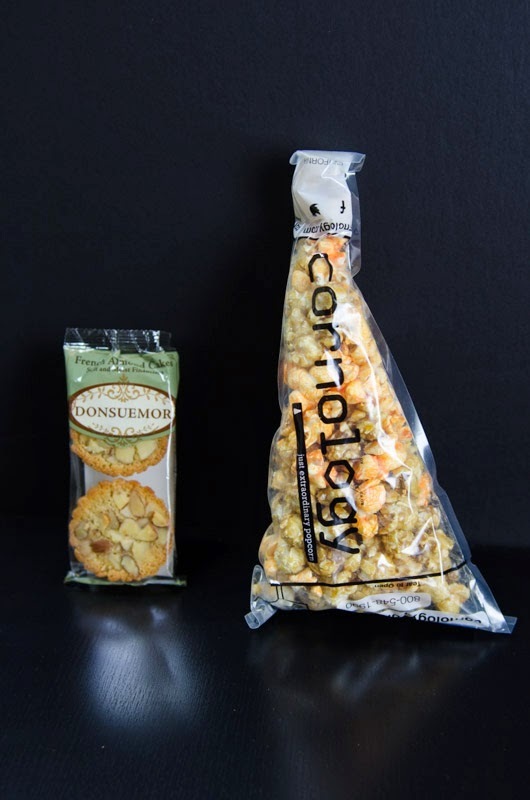 (Right) Cornology C Squared popcorn. $8.95 to $21.95, depending on package size. Not available in the Orange Glad shop. C squared = caramel + cheddar. Does a better popcorn combination exist? I challenge you to name it. On top of offering C Squared (greatest name ever) for sale, the Cornology site also features a small variety of super tempting flavor combos, from truffle Parmesan to chocolate drizzle to Jamaican mojo. Yum. Bonus shot of the almond cakes. So spongy! 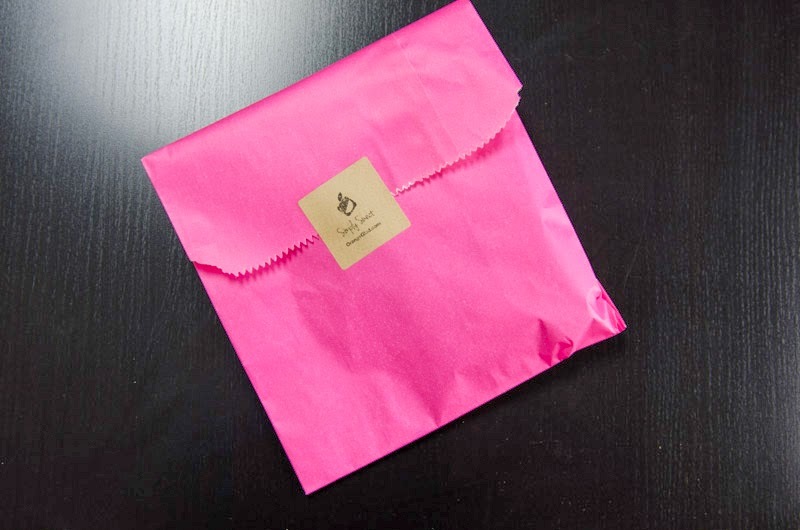 The last item in the box was tucked away at the very bottom, enclosed in this very cute, very mysterious pink envelope. Posh Pantry blueberry swirl cake. I couldn't find a price for this guy: not available in the Orange Glad shop, and Posh Pantry appears to be a wholesale manufacturer of baked goods, so I'm not sure how one might get her mitts on this again. 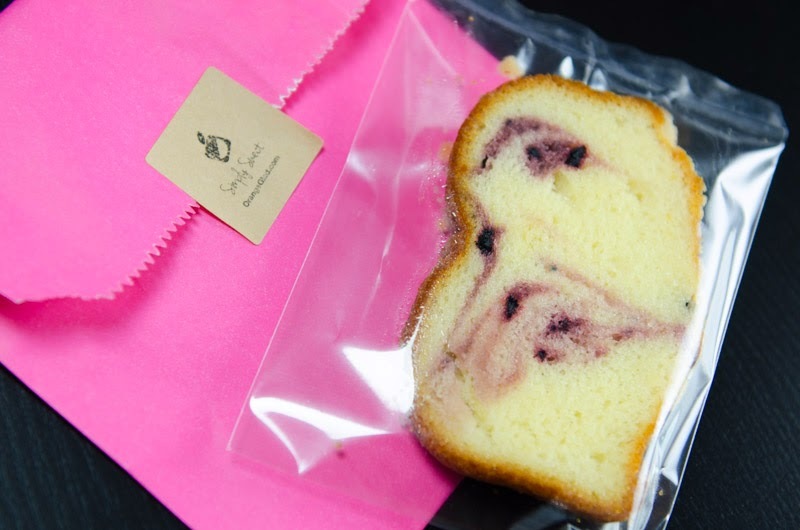 Anyway, this mystery item turned out to be a slice of blueberry pound cake. It was light on the blueberries, kind of on the greasy side, and didn't quite have the natural, homemade taste I'd come to expect from the rest of the products in the box. Still, it was super-moist and light and, again, was a good companion for a cup of coffee. The end. What do you guys think about the March Orange Glad box? This was my first OG box, and I loved it. The amount of treats is manageable enough that I don't have to to roll myself out the front door in the morning, but still indulgent enough that I felt a little naughty for owning this stash of goodies. Perfect balance of good vs. evil, and at a very reasonable price. Speaking of a reasonable price, if your interest is piqued and you'd like to learn more or to sign up for an Orange Glad sub, you can enter code YUMMY10 at checkout to save 10% off your order. Just a little incentive to sweeten (har) the deal even more. Happy Saturday! Now go treat yourselves! I've never heard of this box before... very fancy! 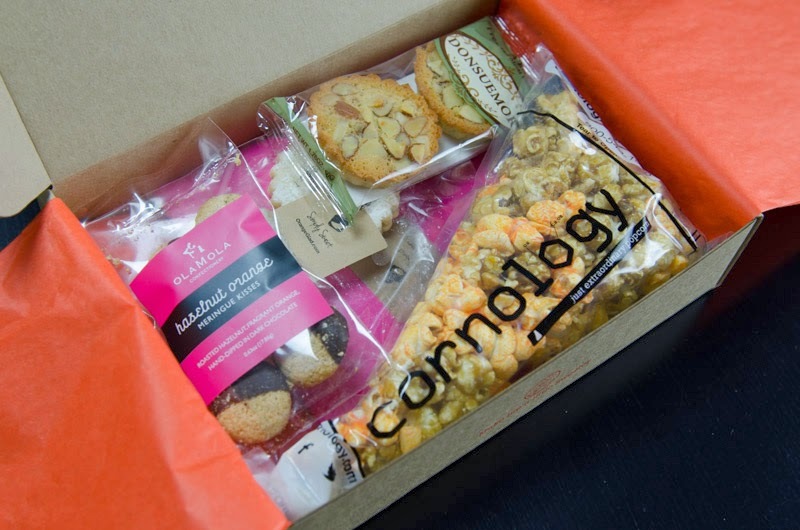 Agreed with you that more subscriptions should offer more single boxes... sometimes you want to buy one as a treat or a gift! So cool that you made a discovery through this blog! But yeah, I hope more subs jump on the one-off bandwagon. Some will let you buy a single, but they'll ship you their introductory box instead of whatever's going out to regular subscribers that month, which is not very exciting at all.